Definition at line 2549 of file Type.h. Definition at line 2591 of file Type.h. Definition at line 2581 of file Type.h. Definition at line 2562 of file Type.h. 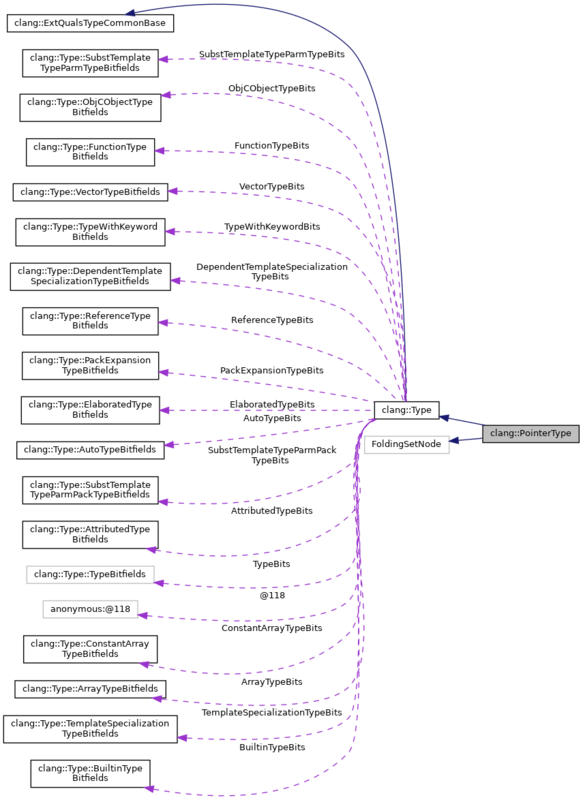 Referenced by clang::Sema::ActOnDependentMemberExpr(), clang::Sema::ActOnObjCAtSynchronizedOperand(), AdjustFunctionParmAndArgTypesForDeduction(), appendPointerType(), clang::Sema::BuildObjCAtThrowStmt(), BuildUniqueMethodName(), CanThrow(), checkBuiltinArgument(), clang::Sema::CheckCastAlign(), checkOpenCLPipePacketType(), clang::Sema::CheckTransparentUnionArgumentConstraints(), clang::Sema::CheckUnresolvedMemberAccess(), clang::CodeGen::CodeGenTypes::ConvertType(), create_dispatch_once(), create_OSAtomicCompareAndSwap(), DiagnoseBadFunctionCast(), clang::CodeGen::CodeGenFunction::EmitCXXPseudoDestructorExpr(), clang::CodeGen::CodeGenFunction::EmitDynamicCast(), clang::CodeGen::CodeGenFunction::EmitLoadOfPointer(), clang::CodeGen::CodeGenFunction::EmitLoadOfPointerLValue(), emitPointerArithmetic(), evenFlexibleArraySize(), clang::Sema::FindCompositePointerType(), getAccessFlag(), getCastAwayConstnessCastKind(), clang::Decl::getFunctionType(), getIncrementedVar(), clang::ASTContext::getObjCGCAttrKind(), clang::Type::hasAttr(), IsAddressSpaceConversion(), isAddressSpaceOverlapping(), IsCFError(), isCFStringType(), IsInitializerListConstructorConversion(), IsNSError(), clang::BinaryOperator::isNullPointerArithmeticExtension(), clang::ento::cocoa::isRefType(), isTypeSubstitutable(), IsUserDefinedConversion(), isValidOrderingForOp(), IsVoidStarType(), clang::analyze_format_string::ArgType::matchesType(), clang::TreeTransform< Derived >::RebuildCXXPseudoDestructorExpr(), clang::CodeGen::CGDebugInfo::remapDIPath(), RemoveAddressSpaceFromPtr(), RewriteOneForwardClassDecl(), scanToNextArgument(), setObjCGCLValueClass(), splitAccordingToPolicy(), TryStaticPointerDowncast(), TypeInfoIsInStandardLibrary(), TypeIsInnerPointer(), clang::ASTContext::UnwrapSimilarTypes(), clang::ASTNodeTraverser< Derived, NodeDelegateType >::VisitPointerType(), and clang::ASTNodeImporter::VisitPointerType(). Returns true if address spaces of pointers overlap. 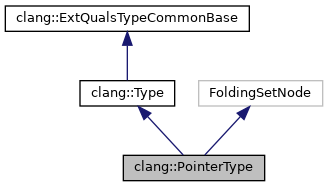 OpenCL v2.0 defines conversion rules for pointers to different address spaces (OpenCLC v2.0 s6.5.5) and notion of overlapping address spaces. CL1.1 or CL1.2: address spaces overlap iff they are they same. CL2.0 adds: __generic overlaps with any address space except for __constant. Definition at line 2572 of file Type.h. References getPointeeType(), clang::QualType::getQualifiers(), and clang::Qualifiers::isAddressSpaceSupersetOf(). Definition at line 2580 of file Type.h. Definition at line 2583 of file Type.h. Definition at line 2587 of file Type.h. Definition at line 2550 of file Type.h.